Corresponding authors. E-mail addresses: decai@bjmu.edu.cn (D.-C. Xiong), xinshan@bjmu.edu.cn (X.-S. Ye). Abstract: A practical and efficient synthesis of phosphatidylinositol pentamannoside (PIM5) was achieved based on a five-component one-pot sequential glycosylation protocol with exclusive regio-and stereo-selectivity. Two regioselective sequential glycosylations on inositol and p-tolyl thioglycosides as the sole type of building blocks made this protocol to avoid the tedious protective group manipulations. This synthetic strategy provides access to other important glycolipids with similar structures. Tuberculosis (TB) is a major cause of mortality worldwide . The thick glycolipid-containing cell envelope of M. tuberculosis is critical for bacterial survival and growth . Among the glycolipids, phosphatidylinositol mannosides (PIMs) and their hypermannosylated structural relatives (lipomannans and lipoarabinomannans), noncovalently anchor to the plasma membrane and the outer capsule through palmitate, stearate and tuberculostearate lipid chains, as determinants for modulating the host immune system and dictating the fate of mycobacteria . 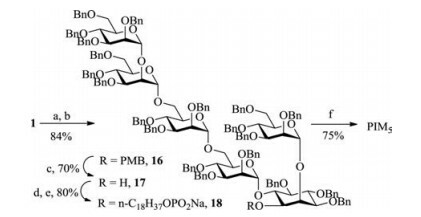 The isolation of homogeneous glycolipids from M. tuberculosis is challenging and does not give access to glycolipid derivatives or substructures. Therefore, chemical synthesis is employed to obtain these glycolipids with defined structures and high purity, which are suitable for biochemical assays and medical applications. PIMs are the biosynthetic precursors of lipomannan and lipoarabinomannan . Especially, phosphatidylinositol pentamannoside (PIM5) is similar to the conserved structure. Thus, PIM5 would be a good synthetic model for the synthesis of tuberculosis-related glycolipids. Elegant methods or strategies have been developed for the synthesis of PIMs and their related compounds [5-30]. However, to the best of our knowledge, there has been no report on the synthesis of the pseudo-hexasaccharide chain in PIM5 by using preactivation-based one-pot glycosylation protocol [31-45]. We describe herein the one-pot sequential assembly of PIM5. Our synthetic plan for PIM5 is depicted in Scheme 1. In our initial plan, the pseudo-hexasaccharide 1 was fragmented into six segments. The core carbohydrate structure 1 would be probably assembled by the preactivation-based one-pot glycosylation protocol. Since most α-mannosyl would be achieved using 2-O-acylated-mannosyl building blocks by virtue of the neighboring group participation, the 2-O-acetyl or benzoyl protective groups were equipped to control the α-glycosyl linkages. The benzoyl group was also used to avoid the acyl migration. 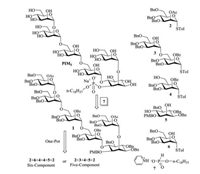 To try the one-pot six-component assembly (2 + 6 + 4 + 4 + 5 + 2), the readily perceptible synthetic issues include the stereoselective glycosylation of blocks 6 and 4 to deliver the necessary 1-6 linkage as well as the regioselective glycosylation between the equatorial hydroxyl and the axial hydroxyl in the inositol unit 5. Because the preliminary experiments involving the glycosyl coupling of the benzylated compound 6 and block 4 gave the poor β selectivity, the disaccharide 3 was chosen as an alternative building block. In addition, it has been proved that the regioselective glycosylation of the inositol blocks can be accomplished using the monosaccharide building blocks step by step [9, 20]. We conceived that it could be also achieved using the oligosaccharide block via one-pot protocol. Therefore, the one-pot five-component assembly of PIM5 (2 + 3 + 4 + 5 + 2) was designed. The lipid 7 would be installed in the final stage. The benzyl group and p-methoxybenzyl group would be utilized as the global protective group and the temporary protective group, respectively. Scheme 1. Retrosynthetic analysis of PIM5. Monosaccharide building blocks 2 and 4 were prepared from mannose [14, 30, 46]. As shown in Scheme 2, peracetylation of mannose and subsequent bromination, followed by the treatment with 2, 4, 6-collidine and MeOH, afforded orthoester 8. Deacetylation of 8 which was followed by perbenzylation provided compound 9 in 95% yield. Glycosylation of 9 and p-thiocresol (TolSH) produced the building block 2 in 65% yield. Compound 8 was subjected to the successive deacetylation, regioselective silylation of the 6-OH using TIPSCl, and benzylation to furnish compound 10 in 69% yield. The reaction of 10 with TolSH generated thiomannoside 11, which was smoothly converted into the building block 4 through deacetylation, benzoylation and desilylation. For the preparation of disaccharide 3, the glycosyl donor 2 was activated at low temperature (–78 ℃) with diphenyl sulfoxide and trifluoromethanesulfonic anhydride (Tf2O), and then the glycosyl acceptor 4 was added to achieve the glycosylation. After a selective deacetylation, the disaccharide building block 3 was obtained in 80% yield over two steps. Scheme 2. Synthesis of building blocks 2-4. Reagents and conditions: (a) HClO4/Ac2O, 0 ℃. (b) HBr/HOAc, r.t. (c) 2, 4, 6-collidine, MeOH/CH2Cl2, reflux. (d) NaOMe/MeOH. (e) NaH, BnBr, DMF. (f) TolSH, BF3.Et2O, CH2Cl2, Ar, 4 Å MS, -78 ℃. (g) TIPSCl, imidazole, DMF. (h) BzCl, Py. (i) TBAF, THF. (j) Ph2SO, Tf2O, Et2O, 4 Å MS, -78 ℃, and then 4. (k) 3% (v/v) AcCl, MeOH/CH2Cl2. The partially protected myo-inositol 5 was prepared over eleven steps (Scheme 3). Starting from methyl glucopyranoside 12, compound 13 was obtained by three consecutive steps . The primary hydroxyl group in 13 was oxidized to an aldehyde using Dess–Martin periodinane (DMP). Then, inositol 14 was readily available from the aldehyde via three-step transformations. The C-2 and C-6 hydroxyl groups in inositol 14 were temporarily masked as ethoxyethyl (EE) ethers. Subsequently, deacetylation, followed by p-methoxybenzylation and removal of the EE groups under acidic conditions, afforded the building block 5 in 73% yield over four steps . Finally, the commercially available octadecanol (15) was phosphorylated using H3PO3, pivaloyl chloride (PivCl) and pyridine to provide the H-phosphonate 7 . Scheme 3. Synthesis of building blocks 5 and 7. 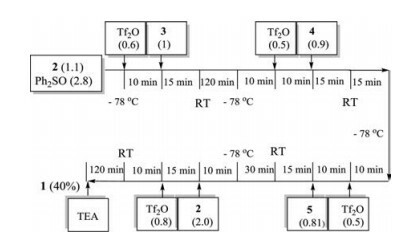 Reagents and conditions: (a) TIPSCl, imidazole, DMF, r.t. (b) NaH, BnBr, DMF, 0 ℃ to r.t. (c) TBAF, THF. (d) DMP, CH2Cl2, r.t. (e) K2CO3, Ac2O, MeCN, reflux. (f) Hg(CF3CO2)2, acetone/H2O (4:1), r.t.; then NaOAc (aq. ), NaCl (aq. ), 0 ℃ to r.t. (g) NaBH(OAc)3, HOAc/MeCN (1:1), 0 ℃ to r.t. (h) PPTS, CH2 = CHOEt, CH2Cl2. (i) NaOMe/MeOH, reflux. (j) PMBCl, NaH, TBAI, THF, r.t. (k) PPTS, n-PrOH, r.t. (l) H3PO3, PivCl, Py. 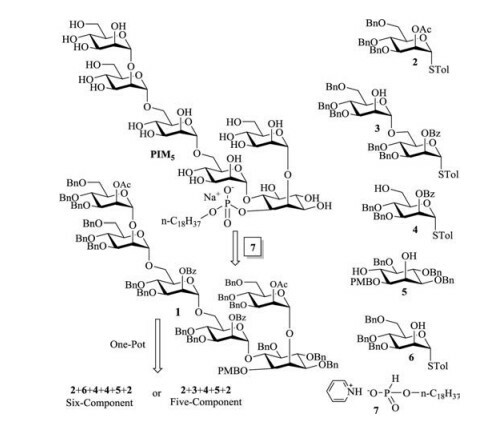 With all building blocks in hand, the five-component assembly of fully protected pseudohexasaccharide derivative 1 was attempted as outlined in Scheme 4. The preactivation of mannoside 2 in dichloromethane at -78 ℃ by Ph2SO/Tf2O for 10 min, was followed by the addition of acceptor 3. After stirring for another 15 min at -78 ℃, the reaction mixture was gradually warmed up to room temperature for 120 min, and then cooled down back to -78 ℃. Following the similar glycosylation protocol, building blocks 4 and 5 were sequentially added to the reaction mixture. Mannoside donor 2 was then added to the reaction mixture, which was activated by substoichiometric amount (0.8 equiv.) of Tf2O at -78 ℃ to continue the glycosyl coupling reaction, affording pseudohexasaccharide 1 in 40% isolated yield (see the Supporting information). It should be noted that the regioselective introduction of tetrasaccharide moiety at the equatorial hydroxyl position of inositol 5 can be realized. The excellent regioselectivity might come from the small steric hindrance of 2-OH in acceptor 5 and the bulky tetrasaccharide donor . The structure of 2-O-mannosyl-6-O-tetraglycosyl-inositol 1 was characterized by extensive NMR experiments (the Supplementary data). Correlations of the anomeric hydrogen (5.58 ppm)/carbon (98.75 ppm) of the tetraglycosyl unit with the H-6 of inositol (4.07 ppm) and the anomeric hydrogen (5.20 ppm)/carbon (98.80 ppm) of mono-mannosyl unit with the H-2 of inositol (4.38 ppm) were observed in its gHMBC and NOESY spectra, confirming that the 6-O-tetraglycosylation and 2-O-mannosylation occurred exclusively on inositol. The α-anomeric configurations of newly-formed glycosyl linkages were established by the one-bond 13C–1H coupling constant (> 170 Hz) of C-1 in the HMBC spectrum. Scheme 4. One-pot assembly of the pseudohexasaccharide. The values given in parentheses denote the number of equivalents of each reagent. Next, all acyl protective groups in pseudohexasaccharide 1 were removed with sodium methoxide in methanol, and the free hydroxyl groups were masked as benzyl ethers to give compound 16. The p-methoxybenzyl group in 16 was removed by treatment with trifluoroacetic acid to provide 17. The attachment of Hphosphonate 7 to pseudohexasaccharide 17 was carried out by using pivaloyl chloride, followed by iodine-mediated in situ oxidation and cation exchange, affording compound 18 in 80% isolated yield. The global hydrogenolysis of the benzyl groups in 18 provided the target PIM5 in 75% yield (Scheme 5). Scheme 5. Phosphorylation and deprotection. Reagents and conditions: (a) NaOMe/MeOH, r.t. (b) NaH, BnBr, DMF, r.t. (c) 5% TFA/CH2Cl2, r.t. (d) PivCl, Py, r.t.; then 7. (e) I2, Py/H2O, r.t. then Na2S2O3 (aq.). (f) 10% Pd/C, H2, EtOAc/THF/n-PrOH/H2O. In conclusion, using a five-component one-pot sequential glycosylation strategy, we have successfully synthesized phosphatidylinositol pentamannoside (PIM5), a key structural motif of antigenic glycolipids found on the cell wall of Mycobacterium tuberculosis. It is noteworthy that p-tolyl thioglycosides as the sole type of building blocks were used in this preactivation-based glycosylation protocol. In addition, two regioselective sequential glycosylations on inositol further simplified the overall synthetic route. By means of the same strategy, some other important glycolipids with similar structures such as lipoarabinomannan (LAM) and glycosylphosphatidylinositol (GPI) anchors could be synthesized to study their structure-activity relationships. This work was financially supported by the National Natural Science Foundation of China (Nos. 21232002, 21572012, and 21772006), Beijing Natural Science Foundation (No. 2142015) and Beijing Higher Education Young Elite Teacher Project (No. YETP0063). Supplementary data associated with this article can be found, in the online version, at https://doi.org/10.1016/j.cclet.2017.12.014. WHO, Tuberculosis factsheet, (2017) October 2016, http://www.who.int/mediacentre/factsheets/fs104/en/. A. Stadelmaier, M.B. Biskup, R.R. Schmidt, Eur. J. Org. Chem. 69 (2004) 3292-3303. X. Huang, L. Huang, H. Wang, X.S. Ye, Angew. Chem. Int. Ed. 43 (2004) 5221-5224. Y. Geng, L.H. Zhang, X.S. Ye, Chem. Commun. 44 (2008) 597-599. L. Yang, Q. Qin, X.S. Ye, Asian J. Org. Chem. 78 (2013) 30-49. Z.J. Jia, L. Olsson, B. Fraser-Reid, Chem. Soc. Perkin Trans. 1 (1998) 631-632.